Math may sometimes confound me and dice certainly hate me, but there has always been one gaming staple that I could fall back on: trivia. Yes, I’m that guy that used to play in weekly trivia leagues, and the one that sometimes ruins Trivial Pursuit for the rest of the group. 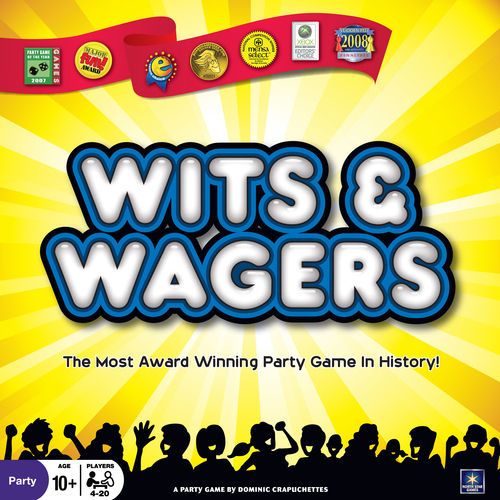 I’m not sure if someone at North Star Games was aware of all this when they offered to send me a review copy of Wits & Wagers, but after playing, I’m pretty sure that it was designed by someone that hated playing Trivial Pursuit with the likes of me. Wits & Wagers is truly the cure for the perfect know-it-all. The game consists of seven rounds. Each round, players will be asked a general trivia question, the answer of which will always be a number of some sort. Players write down their best guess on their handy dry erase board cards before time runs out, and then everyone flips them over to reveal answers. In a regular trivia game, the answer would be read aloud and the person who guessed correctly would win some points or get to move around a board, or just get to brag about it for a few minutes while everyone rolls their eyes. In Wits & Wagers, however, this is where the real fun begins. After all players’ guesses have been revealed, the numbers are arranged on the felt game board in order from highest to lowest. The spaces in which the guesses are placed correspond to a certain payout amount, from 2-to-1 to 5-to-1 (including a 6-to-1 wild bet space for answers lower than the lowest guess). Players can then make one or two bets on which guess(es) they think comes the closest to the correct answer without going over (including their own guess). The answer is read aloud and whomever placed bets on that guess wins a payout, in chips, from the bank according to the payout amount. The player or players that provided the closest guess also wins three chips from the bank. Some players rejoice while other players curse the gods. It’s great fun. Every player receives two betting chips in their color at the start of the game. These chips can never be lost in betting. Any chips won from the bank in subsequent rounds can be placed underneath these starting chips to up the ante on any bet. This can sometimes result in large payouts, but more often, it results in a hilariously huge loss. Since players can never lose their two initial betting chips, no one is ever truly out of the game, as even the mightiest player with a boatload of chips can often be brought down by their own greed and hubris. Oh, have I seen the mighty fall. The mighty being me, of course. Do you know which year the Atari 2600 was released? Without Googling - place your bets! Gameplay is so simple and intuitive that anyone can jump in and be competitive. The simple fact that it’s often not what you know, but what you think others know that makes this game something special. Replay is off the charts - there are 700 questions in the base game, and with 7 rounds per game, that’s over 100 games before you hit repeat questions. For most gamers, that will mean everyone has completely forgotten answers to the first questions by the time they are put back into circulation. There aren’t a ton of components to review for Wits & Wagers, but what is included in the box is fairly nice. The cardboard player betting chips are solid and the use of dry erase boards and markers for recording guesses is a nice touch that everyone liked (except that one marker was completely dry). Some of the gamers in my group weren’t enamored with the felt betting board, but I felt it did the job just fine and gave the game a nice “home Vegas” quality. The bank payout chips are the normal sort of poker chips you would find at your local five & dime. Our group was more than ready to break out some better quality chips from a nicer poker set. 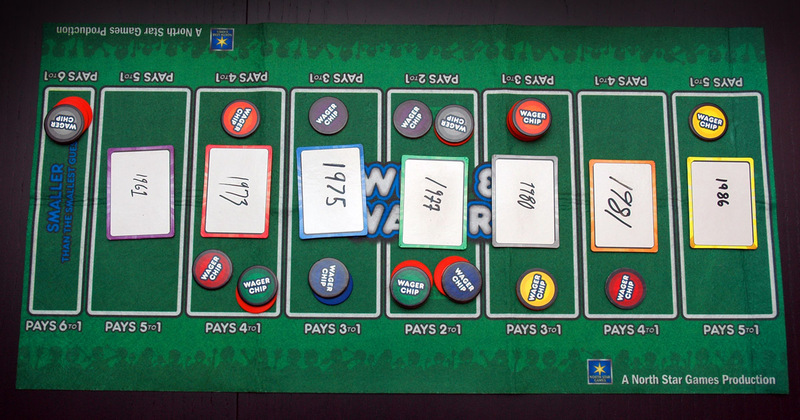 From the very first trivia question, there was no doubt that Wits & Wagers was amazingly fun. Every player in our group - from Sally Thinksalot, whose guess for the world’s total population was in the trillions, to Clover Leaf, who wrote that Forrest Gump’s IQ was a 13 - was able to laugh at their own crazy answers, and hold their own in the game by placing their bets on others. This is definitely a game that almost any group - including family - will have a great time with, especially if, like my lunchgames group, they desperately want to introduce drinks and real money to the next gaming session. Overall score: 16 out of 18 - This one is a total no-brainer for your next social gathering. 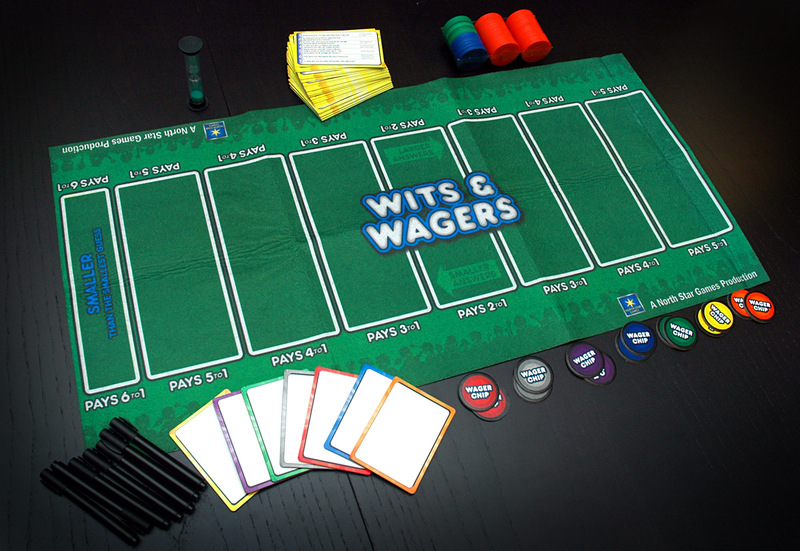 Wits & Wagers is a game for 4 to 20 trivial gamblers, ages 10 and up, designed by Dominic Crapuchettes for North Star Games. It retails for about $24 at Funagain Games or at your favorite local game store. Any thoughts on how this compares to Say Anything by Northstar? I had to make the choice between those two games at my local Borders before a party and I went with Say Anything for the simple reason that a lot of the people I was going to play with weren’t “math people”. So I wanted to have something that was a little more flexible with all ages. Turned out that Say Anything was a total blast and we were all beaten by a 10 year old girl! Does the fact that all your answers have to be numerical hinder the enjoyment for some people? I would imagine most of the fun is betting on which answer is correct, not coming up with the correct answer yourself. Ian – Honestly, I’ve wanted to play both Wits & Wagers and Say Anything for the longest time, and never got around to it. North Star Games was kind enough to send me a review copy of Wits & Wagers and after playing it, I will probably pick up Say Anything. I have heard a lot of good things about that game, and if it’s half as enjoyable as Wits & Wagers, it won’t disappoint. The numerical factor hasn’t hindered anyone in my group. Sally’s answers are some of the craziest we’ve ever seen, but every now and then she shocks us all and gives the best answer. The fun is in the betting, and the wilder the parity between answers, the more outrageous the betting can get.